I made us punch! Spiked pomegranate orange punch to be exact. That’s reason enough to celebrate. I just cannot get enough of these gorgeous autumn jewels. I want to decorate my house with pomegranate arils, I love them that much. It would probably look gorgeous aside from the potential murder scene appearance. Every time I slice one open it’s like I just walked into a Dexter scene. So let’s be real: I’ve been on a mission to create something non-apple flavored for Thanksgiving. And for other general November parties, things before Christmas and what not. Parties with cocktails where you’re APPLED out. I’ve completely overdone apple cider sangria, apple cider margaritas, even the apple old fashioned. I wanted something PINK! Truth be told, I’m not the hugest fan of orange. 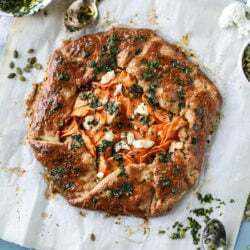 The only orange recipe that I 100% love is the orange cinnamon pull apart bread I made a few years ago. And that’s probably only because it reminds me of Christmas morning and those cinnamon orange rolls that come out of a can. But in my non-apple quest, I wanted something a little sweet and citrusy, something that balanced the tartness of the pomegranate juice. We looooove pomegranate juice in this house and almost always have it on hand come the fall season. Eddie throws it in his smoothies in the morning and I can’t get enough of pomegranate margaritas. The teeeeeniest bit of orange makes the pom taste really wonderful! Even I’ll admit it. Into the pitcher also goes a bottle of champagne! Choose a champagne you love. I went with a semi-dry version because I still love a little sweetness but I didn’t want it TOO sweet. Because! The best part of this entire punch is the vanilla ginger syrup that gets added. I happened to have some leftover in my fridge from making these cranberry margaritas last week. That stuff is so freaking fantastic. I could drink it through a straw. You can absolutely add as much or as little as you’d like. It complements the ginger beer too and this entire flavor profile just WORKS. Also – why yes I did add sparkly gold star sprinkles because HELLO it’s punch! Combine all ingredients together in a large pitcher or bowl and serve over ice! Since we are using champagne here, I wouldn’t make this the day or night before because the bubbles will go flat. You can make it about an hour before and you’ll be good. I like to put the orange slices on the inside of the glass before the ice. Fill with ice, then with punch and a sprinkling of pom seeds! p.s. now let’s have a party. woooo! i too am appled out, & i too LOVE pom jewels, & i too love gold glitter stars (bd #duh). can’t wait to try this out…the ginger syrup really does sound divine! cheers! O it looks lovely! I’m always excited for pomegranate season and the abundance I’ve been seeing in the stores already!!! I’m always inspired by your food photography, but your cocktail photos are always especially awesome! These photos are so gorgeous, and I love how you added the orange slices around the glass! Also loving this flavor combination for Thanksgiving. Thanks for sharing! This literally looks like a winter dream. Yes please x a thousand! thanks gabriella! i thought the same! 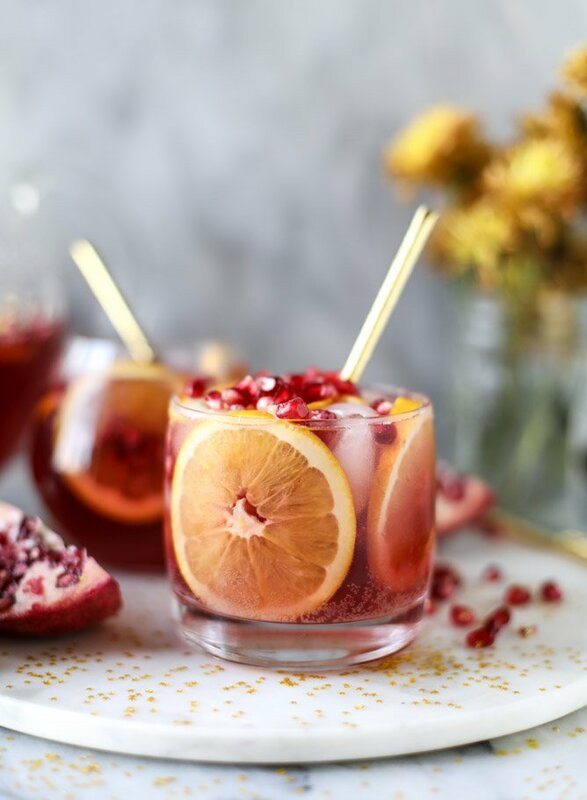 This drink is so festive and perfect for the holidays! This looks gorgeous!!!! Any suggestions on how to make it non-alcoholic?? sure! you could just get a non-alcoholic sparking wine or juice – or you could even do a mix of all ginger ale or ginger beer? maybe some club soda too! maybe a pomegranate or orange italian soda?? Pomegranate is sooo good for you! Thank you for the great ideas, and for this additional modification for a non-alcoholic mixture. I might have to make to separate bowls or pitchers! Stunning and delish! I, too, don’t love orange, except in chocolate and at the holidays (cranberry-orange bread with pecans on christmas morning!). And absolutely can.not.get.enough POMS in November & December!! Was seeding 4 at my Dad’s last weekend and announced to the whole fam “if anyone comes in here and says anything smart-assy I will legit stab you because seeding poms tests all of my patience” but my gosh it is so worth it. And I got a whole hour of peace and quiet. I agree – the vanilla ginger is to die for!! Ugh I love that contrast in sweet and spicy. GIRL. 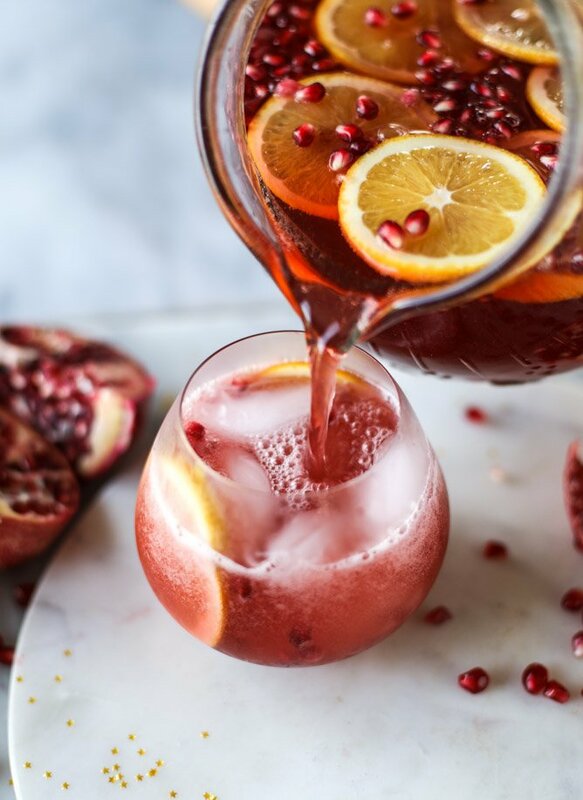 This is basically my dream punch, those pomegranate seeds are beyond gorgeous! you can use ginger ale! or if you don’t want ginger, maybe a mix between club soda and an orange or pom italian soda? What a gorgeous holiday cocktail! I really do appreciate the no apple flavoring too! I love all things apple but by the time the holidays get here I’m ready for citrus! i just grabbed them at joann’s last week! i think they were wilton?? Um, im soooo making these for the Christmas Party this year ! Thanks so much for this awesome recipe !